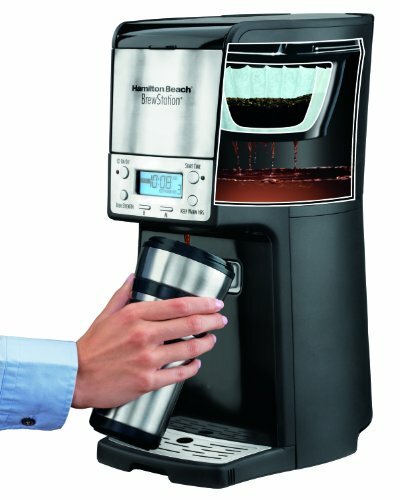 The Hamilton Beach Brewstation is an automatic coffee maker that allows the user to brew single or multiple cups of coffee from pre-ground beans. The Brewstation can also be used to make ice coffee. Instead of a carafe and hot plate, the Brewstation keeps the coffee warm internally via an insulated tank, allowing the user to dispense the required amount directly into a cup, mug or travel thermos. The Brewstation is programmable and offers the options of bold and regular strength coffee. The user can also reheat cold coffee (bypassing the brew function) should they wish to do so. Overall, this is a neat, compact and versatile coffee machine that should appeal to a variety of home and office-based coffee lovers. Note that while there are 10 and 12-cup versions of the Brewstation available, neither is equipped with a carafe or hotplate. The Brewstation is a compact, good-looking coffee machine that largely delivers on its promise of convenience. Most drip coffee makers feature a carafe into which the coffee is brewed and a hot plate to keep the coffee warm until it is drunk. Some of these types of machine may come with an insulated carafe, which does the same thing without the need for a hotplate. The Brewstation has neither of these. Instead, the coffee is brewed and stored inside the thermal, insulated internal unit. The coffee can then be dispensed, as required, directly into a cup, mug or thermos. The Brewstation is sold with everything you need to brew, except filters and coffee. You can use either a permanent filter or disposable paper filters in the brew basket. The coffee you choose should be pre-ground (medium grind is best). When you’re ready brew, place a filter into the brew basket and add the required amount of ground coffee. A level tablespoon per cup is recommended, but you’re free to add more/less according to taste. The Brewstation offers the choice of regular and bold strengths, so you can play around until you find the ideal combination for you and your coffee companions. The next stage is to fill the removable coffee tank with the required amount of water. This is where things get a bit tricky as you have to pour the water from the coffee tank into the reservoir. To reduce stress levels, it’s best to make peace with the fact that there will inevitably be spills, at least until you get the hang of it! You then make your selections. These include strength and small-batch brewing. If you’re only making one to four cups, there is a special setting for this. You can also program the machine to start brewing at a specific time. In addition, you can select how long to keep the brewed coffee hot via the auto shut-off option (from zero to four hours). Bonus: the Brewstation can handle making ice coffee! To do this, you basically add ice to the coffee tank and brew a stronger batch of coffee, selecting the ‘zero’ option on the ‘keep warm hours’ setting. There is also the option to reheat coffee. Once your coffee has brewed (it beeps to let you know when the cycle has completed), you can dispense it directly into your cup. The manufacturer has made this a simple ‘one hand’ function through the use of a dispensing bar located above the cup stand. Simply push the cup or mug against the bar and out comes the coffee! Pull the cup away when you have all you want. For travel mugs or other vessels over seven inches in height, you will need to hold at an angle to fill. So, is the Brewstation system better than the tradition carafe system? Well, it certainly has its advantages. Firstly, the unit boasts a slim design, which means it can fit into smaller spaces than the average drip coffee maker. Secondly, there are fewer parts to worry about, so no more accidentally smashing your glass carafe or burning your fingers on the hotplate. However, while the manufacturer promises the Brewstationcan keep coffee hot for up to four hours without scorching the flavor, in truth, keeping coffee hanging around for four hours will negatively impact the flavor however it’s stored. It may not taste scorched with the Brewstation, but it won’t taste freshly brewed. If you prioritize the taste of your coffee over the convenience of having a full ‘pot’, the easy solution is to brew less coffee more frequently. It’s worth pointing out that the Brewstation is fitted with quite a short electric cord. This is safety feature to minimize the risk of tangles and trips. While this may be frustrating for some users, it shouldn’t be a deal breaker as you can use an approved extension cord. Cleaning the unit requires running a pint of vinegar through the brew cycle and flushing it out with water. This is pretty straightforward, if a little time consuming, as you need run two or three brew cycles with clean water, letting the unit cool between each one. The manufacturer recommends cleaning the Brewstation on a monthly basis (weekly in hard water areas). The machine will let you know when it needs attention by flashing up ‘CLEAN’ on the control panel. This will happen after 30 brew cycles or when the internal sensor picks up any residue buildup. The unit should also be cleaned before the first use. The removable parts of the Brewstation (i.e. the filter basket and coffee tank) can be cleaned in warm, soapy water. The filterbasket is also dishwasher safe (place on the top rack). The outside of the Brewstation can be wiped down with warm, soapy water and a soft cloth. 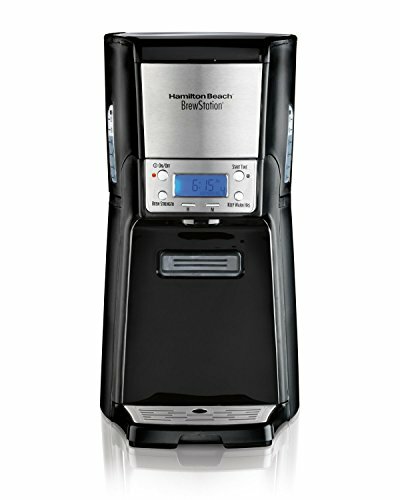 With the Brewstation, Hamilton Beach has captured the convenience of vending-style coffee with the quality of drip brew. Minus a carafe and hotplate, you can brew a ‘pot’ and keep it warm in the thermal tank for up to four hours. When you need a caffeine fix, simply push your cup against the handy dispensing bar and take what you need. It can even handle ice coffee. What could be better? For office workers seeking a solution to their coffee-making needs, the Brewstation is worth some serious consideration. Likewise, for home coffee lovers looking for a reasonably priced machine that offers this type of compact flexibility, the Brewstation should certainly be on their shortlist of possibilities. There are a few issues to be aware of with the Brewstation. Minor gripes include a short electrical cord and the slightly awkward procedure involved when filling the unit with water. If coffee quality is your main concern, it’s worth sticking to the single or small-batch options. While a good coffee machine may be able to keep coffee warm for hours, it won’t taste freshly brewed for longer than about 30 minutes (which goes the same for most coffee makers, not just the Brewstation). Pros: The Brewstationoffers coffee-brewing flexibility at a good price. The internal warming tank can keep coffee hot for up to four hours. You can easily brew a single cup, multiple cups and ice coffee. The ‘one hand’ dispensing bar makes pouring the required amount of coffee a breeze. The settings and programming functions are easy to operate. Maintenance is simple. This machine would be especially good for an office setting, but the compact design makes it attractive to lots of different users. Cons: The Brewstation can keep coffee warm for hours, but some users report the quality declines after about 30 minutes. Filling the unit with water is quite awkward. It also has quite a short electrical cord, which might be an issue for some users. If you like the traditional carafe/hotplate setup, the Brewstation may not be the best coffee machine for you. In a sentence? The Hamilton Beach Brewstation is a compact, versatile, and easy-to-use coffee maker that offers real convenience at a budget price, with the option to brew single and multiple cups (as well as ice coffee) without the need for a hotplate or the hassle of a carafe.